on the west parking lot of the Danforth Plant Science Center complex, at the corner of Olive & Warson Rd. The instructions below will help you prepare for and install your nuc. The earlier you arrive to pick up the nuc, the better. Please review these instructions before taking delivery of your nuc. Bees will be flying at the pick-up point. Please wear protective clothing or a veil. Shorts and sandals are not recommended. The nuc should be picked up and held under the bottom board. Do not pick up the nuc by the outer cover. There are no handholds on the cover. The nuc box may come apart if you pick it up by the top. Nucs unclaimed at 8:00 a.m. may be deemed forfeited. Please notify us immediately if you will be unable to pick up your nuc at 314-669-1828. EMBA will be selling bucket feeders and division board feeders $8.00 each at the nuc pickup. Remember nucs need constant feeding until they have all the comb drawn out. Your goal is to provide maximum ventilation during transport, deliver the nuc to its stand location as soon as possible, and remove the front screen, allowing the bees to fly. (Also see, “How to Transport and Install a Nuc by Tony Jadczak, Maine State Apiarist”) club handout. The nuc is highly perishable. Cool air and ventilation are required to avoid suffocation or over heating while being transported. Transport your nuc in an uncovered truck bed or on the floor of your car or van, with the windows open. The open bed of a pick-up truck is ideal for transporting a nuc. Do not place the nuc in the trunk of a car or in an enclosed truck shell. Do not leave the nuc in a parked vehicle. Transport the nuc to its destination immediately after loading, without interruption for stops. If you transport the nuc in your car, you may drape a sheet loosely over the nuc in order to prevent “hangers-on” from flying before you take the nuc out of the car. Bees that are loose in a vehicle will fly to the windows. When the bees are on the window, open it and they will fly out. If you are concerned about bees flying in your car, have a veil available so that you do not endanger yourself or others while driving. A screen is in the nuc entrance to prevent the bees from flying while you are taking it to its location. The bees may suffocate, overheat, and die if the screen remains in place too long during daytime temperatures. Nucs that are not in transit should be opened as soon as possible, before 9:00 a.m.
Assemble and place your hive stand and woodenware before the pick-up day. Install the nuc in a hive body according to the written instructions you will receive. You will need a Phillips-head screwdriver to remove the outer cover of the nuc box. Wear protective clothing. Have your smoker, syrup, and feeder available and ready. Inspect the colony every 7-10 days, and contact your mentor if you are uncertain. If you have not made a hive stand, do so now! There are a variety of approaches in the literature we have distributed. 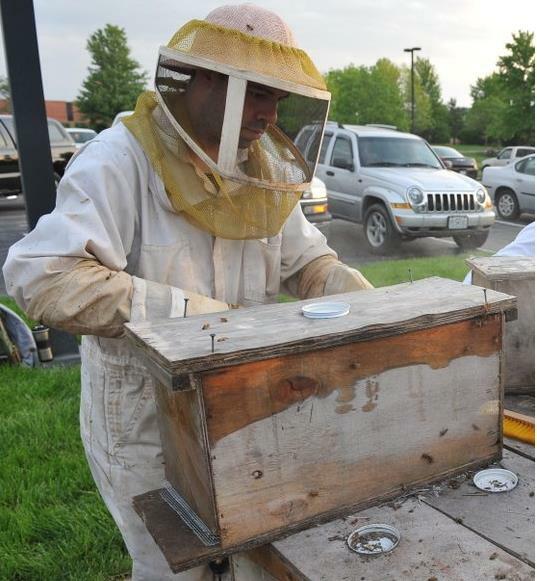 One approach we find works well is to place the hive on a treated wood frame set on concrete pavers, bricks, or blocks. Using this approach, place four concrete pavers – 8″x 8″x 4″ – on the ground, to go beneath the corners of a rectangular, treated wood, stand. Place and level the hive stand on the pavers (you can shim up the hives at the rear, but it is good for the stand to be level).